Crystal Gray is an accomplished yoga teacher who has successfully started and sold a thriving yoga studio. She loves leading students through classes that incorporates alignment and intelligent sequencing to build up to pinnacle poses. 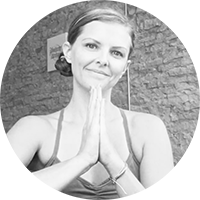 Her classes are great for new students all the way to yoga teachers themselves as her cueing, alignment and sequencing can all be incorporated into a home practice or into planning classes for your students. She helps new yoga teachers own their gifts by working with them to uncover who their dream client is and by giving them the tools to develop unique and inspiring classes that will keep those students coming back class after class! Crystal has built thriving tribes in her local community as well as online. In addition to opening and selling a successful yoga studio, she owns a 20 acre organic farm with her husband and balances her online business while taking care of their daughter. Teaching since 2005, she inspires women to step fully into their power and start creating a life and business that will give them the abundance they deserve.